A Hailey man was listed in critical condition at a Boise hospital Tuesday after being injured in an accident Sunday morning at the Sun Valley Sinclair gas station. Sun Valley police identified the injured man as 71-year-old Charles Bruce Innes. He was initially transported by Ketchum Fire Department ambulance to St. Luke’s Wood River hospital and was transferred from there by emergency medical helicopter to Saint Alphonsus Regional Medical Center in Boise. 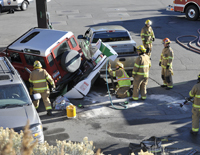 The accident occurred shortly after 8:30 a.m. when a Ketchum man backed a 1997 red Land Rover into a gas pump, smashing it and spilling fuel, striking Innes and his vehicle and hitting another vehicle that was being fueled. The driver of the second vehicle struck by the Land Rover was not injured. Femling credited the driver, Robert A. Juracek, 62, of Ketchum, with thinking quickly and pushing the fuel shutoff button and preventing a larger spill. Emergency responders from the Sun Valley and Ketchum fire departments, the Sun Valley Police Department and the Blaine County Sheriff’s Office were dispatched to the scene to care for the injured man, clean up spilled gasoline, keep traffic away from the accident area and to investigate the circumstances of the crash. Sun Valley Assistant Fire Chief Charlie Butterfield said good coordination among the agencies kept a bad situation from getting worse. “Anytime a vehicle hits a gas pump, that’s a big concern of ours because of the fuel spilled and the possibility of a fire,” Butterfield said.